The common wombat is the largest burrowing herbivorous mammal. Indeed, it is such an accomplished burrower that early settlers called it a 'badger', a term that is still heard today. However, the closest relative of the wombat is, in fact, the koala. With its short tail and legs, characteristic waddle and 'cuddly' appearance, the wombat is one of the most endearing of Australia's native animals. It is a fairly large, solidly built animal with a squat, round, bearlike body, small ears and eyes, and a large naked nose. Its thick, coarse fur varies in colour from sandy brown to grey and black, and is sometimes flecked with fawn.Often their true colour is obscured by the colour of the dirt or clay in which they have been digging. On the mainland they average 1 m in length and 27 kg in weight yet can reach up to 1.2 m in length and weights of up to 35 kg. The Tasmanian Wombat is not as large or bulky, averaging 85 cm in length and 20 kg in weight, while the Flinders Island wombat is smaller still at only 75 cm in length. They have short legs, large paws and long, strong claws which are used in the excavation of burrows. The forepaws are used for digging: after pushing the dirt to one side, the wombat will back out, moving the loose dirt with both the front and back paws. It differs from all other marsupials by having a single pair of upper and lower incisors (front teeth). These teeth are never ground away as they are both rootless and never stop growing, which is just as well as the wombat often uses them for cutting through obstructions, much like a beaver! Being marsupials, female wombats have a pouch that in their case opens backward to prevent dirt and debris entering while burrowing. Wombats are mostly nocturnal, usually coming out at night to graze when temperatures are lower. However, in cold periods they may sometimes be seen about during the day either grazing or basking in the sun. They graze for between 3 and 8 hours a night, during which time they may travel many kilometres and visit up to four burrows within their home range to rest or tidy up the burrow. Although they are solitary animals, with only one wombat inhabiting any one burrow, the overlap of home ranges does occasionally result in a number of wombats using the same burrow. To avoid the overlap of feeding areas they use scent-marking, vocalisations and aggressive displays. Wombats not only leave their burrow to graze but will also spend time rubbing themselves against logs or branches. If used often enough, these rubbing posts may be recognised by their worn or polished appearance. The distinctive cube shaped dung of the wombat is a useful indication of its comings and goings. Any new object within a home range is a prime target for marking with dung, particularly if it is elevated. Fallen trees, fresh mushrooms, rocks and even an upright stick have been found with dung on top! The cube shape means that dung is less likely to roll off such objects. The rump of the wombat is covered by a very tough, thick skin. If threatened, a wombat will dive into a nearby burrow or hollow log, using its rump as protection from the teeth and claws of its attacker. 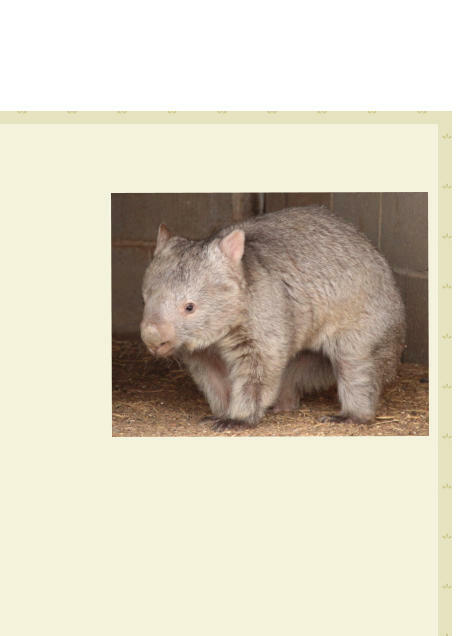 The wombat is also capable of crushing attackers against the burrow roof. Their natural enemies are Tasmanian devils and eagles, while no doubt the thylacine once preyed upon them. Although the wombat may breed at any time of the year, mating most often occurs during winter. The female has 2 teats in her pouch yet despite this, 30 days after mating, only one young is born. The juvenile remains in the pouch for 6 months, after which it stays with the female until it is 18 months old. From the time the juvenile leaves the pouch, it begins to substitute increasing amounts of plant material for milk until, when about 15 months old, it stops suckling altogether. Sexual maturity is reached at 2 years of age and wombats live for in excess of 5 years in the wild. Due to the long period of time that the young is dependent on the mother, it is likely that females only rear one young every two years. However, if the young dies early, or if conditions are good enough for it to leave the pouch early, she may raise another. The common wombat is the largest burrowing herbivorous mammal. Indeed, it is such an accomplished burrower that early settlers called it a 'badger', a term that is still heard today. However, the closest relative of the wombat is, in fact, the koala. With its short tail and legs, characteristic waddle and 'cuddly' appearance, the wombat is one of the most endearing of Australia's native animals. It is a fairly large, solidly built animal with a squat, round, bearlike body, small ears and eyes, and a large naked nose. Its thick, coarse fur varies in colour from sandy brown to grey and black, and is sometimes flecked with fawn.Often their true colour is obscured by the colour of the dirt or clay in which they have been digging. On the mainland they average 1 m in length and 27 kg in weight yet can reach up to 1.2 m in length and weights of up to 35 kg. The Tasmanian Wombat is not as large or bulky, averaging 85 cm in length and 20 kg in weight, while the Flinders Island wombat is smaller still at only 75 cm in length. They have short legs, large paws and long, strong claws which are used in the excavation of burrows. The forepaws are used for digging: after pushing the dirt to one side, the wombat will back out, moving the loose dirt with both the front and back paws. It differs from all other marsupials by having a single pair of upper and lower incisors (front teeth). These teeth are never ground away as they are both rootless and never stop growing, which is just as well as the wombat often uses them for cutting through obstructions, much like a beaver! Being marsupials, female wombats have a pouch that in their case opens backward to prevent dirt and debris entering while burrowing. Wombats are mostly nocturnal, usually coming out at night to graze when temperatures are lower. However, in cold periods they may sometimes be seen about during the day either grazing or basking in the sun. They graze for between 3 and 8 hours a night, during which time they may travel many kilometres and visit up to four burrows within their home range to rest or tidy up the burrow. Although they are solitary animals, with only one wombat inhabiting any one burrow, the overlap of home ranges does occasionally result in a number of wombats using the same burrow. To avoid the overlap of feeding areas they use scent- marking, vocalisations and aggressive displays. Wombats not only leave their burrow to graze but will also spend time rubbing themselves against logs or branches. If used often enough, these rubbing posts may be recognised by their worn or polished appearance. The distinctive cube shaped dung of the wombat is a useful indication of its comings and goings. Any new object within a home range is a prime target for marking with dung, particularly if it is elevated. Fallen trees, fresh mushrooms, rocks and even an upright stick have been found with dung on top! The cube shape means that dung is less likely to roll off such objects. The rump of the wombat is covered by a very tough, thick skin. If threatened, a wombat will dive into a nearby burrow or hollow log, using its rump as protection from the teeth and claws of its attacker. The wombat is also capable of crushing attackers against the burrow roof. Their natural enemies are Tasmanian devils and eagles, while no doubt the thylacine once preyed upon them. Although the wombat may breed at any time of the year, mating most often occurs during winter. The female has 2 teats in her pouch yet despite this, 30 days after mating, only one young is born. The juvenile remains in the pouch for 6 months, after which it stays with the female until it is 18 months old. From the time the juvenile leaves the pouch, it begins to substitute increasing amounts of plant material for milk until, when about 15 months old, it stops suckling altogether. Sexual maturity is reached at 2 years of age and wombats live for in excess of 5 years in the wild. Due to the long period of time that the young is dependent on the mother, it is likely that females only rear one young every two years. However, if the young dies early, or if conditions are good enough for it to leave the pouch early, she may raise another.